Braces use constant, gentle pressure, which over time, move teeth into their proper positions. Your braces are at work every moment of your orthodontic treatment. The two main components of your braces are: the brackets that are placed on your teeth and the main archwire that connects them. The bracket is a piece of shaped metal or ceramic that we affix to each tooth. The archwire is bent to reflect your “ideal” bite. In other words, it reflects the way we want you to look after treatment. To discuss getting braces in the area, please feel free to contact us to schedule an appointment. 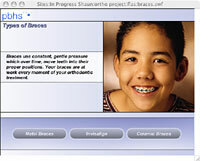 For a brief narrated overview of the different types of braces, please click on the image in the right column. It will launch our flash educational module in a separate window that may answer some of your questions about different types of braces. The wire threads through the brackets and, as the wire tries to return to its original shape, it applies pressure to move your teeth. Picture your tooth resting in your jaw bone. With pressure on one side of the archwire, the bone on the other side gives way. The tooth moves. New bone grows in behind. Metal braces are the most popular with kids and teenagers. They love using different colors of elastic ties. These braces are much smaller than ever before. Translucent clear ceramic braces are the most popular with adults. You have to be very close to someone to be able to see them. Yet, because they are a ceramic material, they are more fragile and will fracture occasionally during treatment. 5 out of 5 stars based on 102 Braces reviews. always an ease of scheduling appointments. The environment is always fun and positive with tons of laughter. i would do it all over again in a heart beat. I am very pleased with the way my teeth look, and the staff were always super friendly. I strongly recommend. I had really really bad teeth, so the fact that my teeth are nice and straight is all thanks to you guys! You were all so sweet and kind and put hygiene first which was amazing. Thank you for fixing my teeth, i'm so grateful. No one wants dental or ortho work but having Dr. Retoma and the staff made it such an easier process making the whole procedure better! Always made sure I was comfortable through every appt. All the staff always made a point to say hi, made you feel like someone important. Wonderful office. Love everything about the office!